This process is strongly recommended (see below). Any seller that wants to accept Paypal payments must complete this step. PayPal is a payment platform that works in conjunction with our service to process your customers' payments by receiving their credit card or bank information. Registering for PayPal accounts is free. IMPORTANT NOTE: Please note a Personal PayPal account is not recommended for use with PayLoadz. A valid Paypal Business or Premiere account is necessary to use many functions of the PayLoadz service. Some users may choose not to use a PayPal account. You may instead opt for one of the other payment platforms like Google Checkout, but your account will not have some of the advanced functions. We strongly suggest you use Paypal as your initial payment platform choice as it is the easiest to setup and most functional with PayLoadz. You can also access the PayPal account registration process by visiting https://www.paypal.com and then click "Sign Up". Once at the registration form, follow the on-screen instructions to create a PayPal account. You do not need to register for a new PayPal account. You can use your existing account with our service. Using an existing account with our service will not affect any of your other non-digital good transactions that are processed at PayPal. 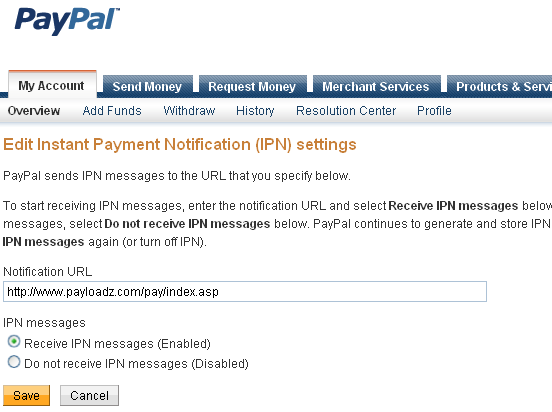 For settting the IPN in paypal account, Please visit this link :- https://www.paypal.com/US/cgi-bin/webscr?cmd=_profile-ipn-notify. Then you will find the below screen. Now save setting and log out of your PayPal account. You will now receive instant notifications of payments to your email when there is a transaction made. A PayPal Business or Premiere account is required to use our service. 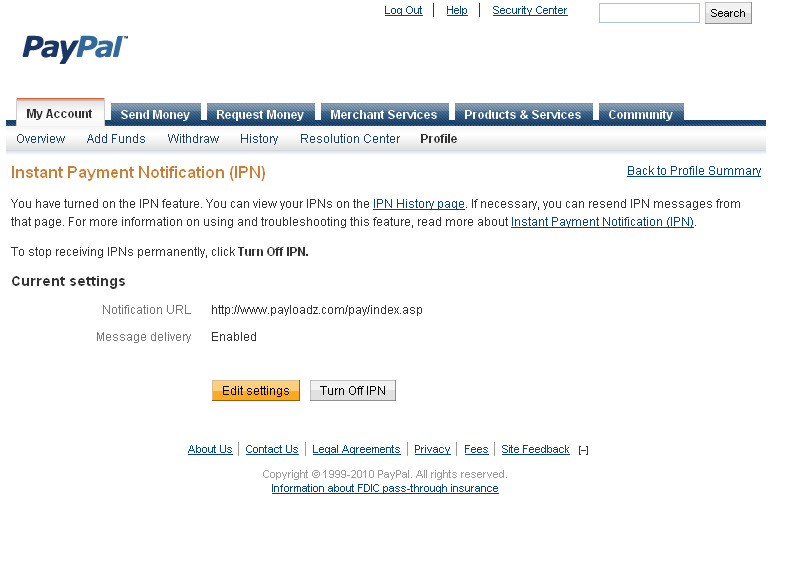 A PayPal personal account will not function properly. It is a free upgrade to change from a PayPal Personal account to a PayPal Premiere or Business account. PayPal also allows each individual to have two accounts, one Personal, and the other either a Premiere or Business account.